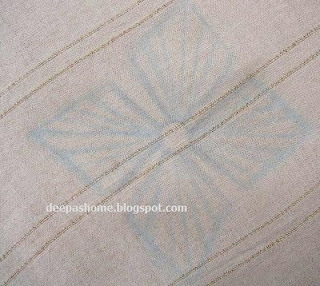 Couple of months back, I received a mail from Linda Chadwick regarding a variation of Kamal Kadai which her mom had done. While corresponding about the same, I'd told her that I'd try and post a tutorial on how to do this variation.For those who're unaware of Kamal Kadai aka Navar Kuttu aka Teneriffe ,here's the tutorial of the actual method. 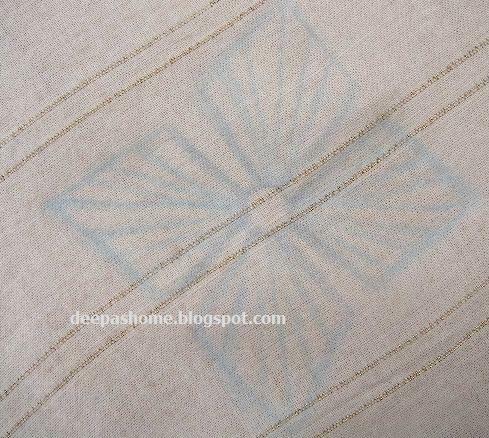 Today's variation is slightly different from the original in that it uses beads and a slight change in the weaving method.Let us see how it goes.Click on the photographs for better view. 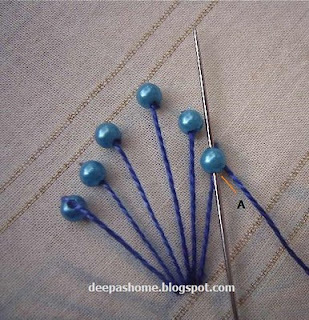 Here's the basic structure of the flower Iam going to stitch. Add lines in a staggered manner to each petal. First draw the middle line from the tip of the petal to the base . Then add even number of lines to either side. Remember, the total number of divisions in each petal should be odd. The base for weaving is being created here.Come up at the bottom of the petal and string the bead. 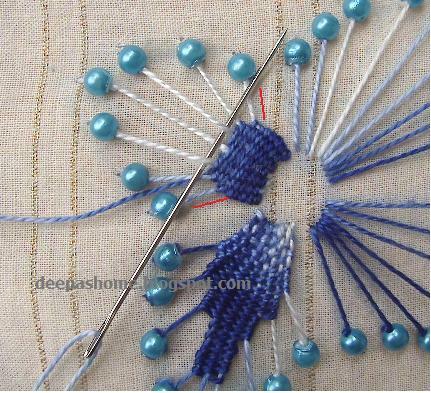 Note that I've marked the hole through which the thread enters the bead as 'A'. Go down according to the diagram made earlier and come up at a point close by. Now, pass the needle through 'A' again and go down to tack down the bead. 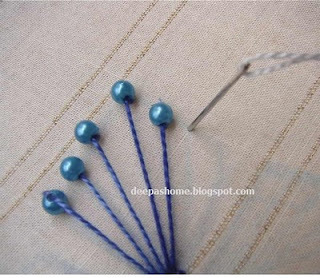 If you don't do this ,your bead will be running up and down the thread. You don't want that,do you? Start the weaving as in the original tutorial . 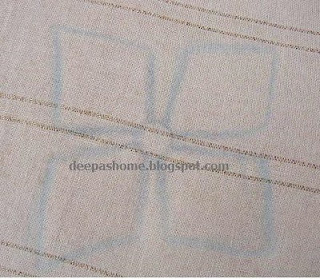 Note that after a certain level, you've to skip the outer most foundation lines so as to give a step by step effect. Let me show you one more pic. Have a look at the pic above.After weaving through the entire 7 lines in the petal for 7 or 8 times, I skipped the lines marked with red and continued the weaving through the middle 5 lines. Then I skipped the outer lines in that bunch ,weaved through remaining 3 lines and ended the weaving slightly below the top beads. Here's the completed flower with the jumbo beads. 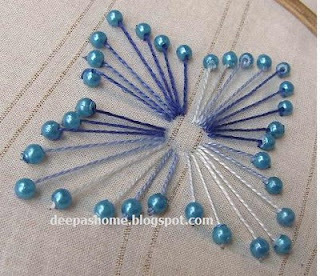 To be frank, I don't like those beads there at all.If you're attempting this method,get some smaller beads.Small is always beautiful!! This flower is infact stitched on a recycled cushion cover with the old dupatta. It looks like this now. Iam wondering what to add on for the completed look. Some more jumbo beads here and there? Some flowers here and there? What do you think?I seem to be running short of ideas. An undergrad guy has been coming to learn programming during the past few days.He was desperate as there is only one month left for the final exam and he has absolutely no idea what programming is.Iam trying my best to help him out.So my head is kind of stuffed with programming concepts now. This tutorial sprouted somewhere in the middle of all that.Hope you enjoyed it. Coming out of lurkdom Deepa to thank you for this tutorial! I have never seen this done before and I love it. Can't wait to try it! Would you mind if I printed your instructions off so I can refer to it? 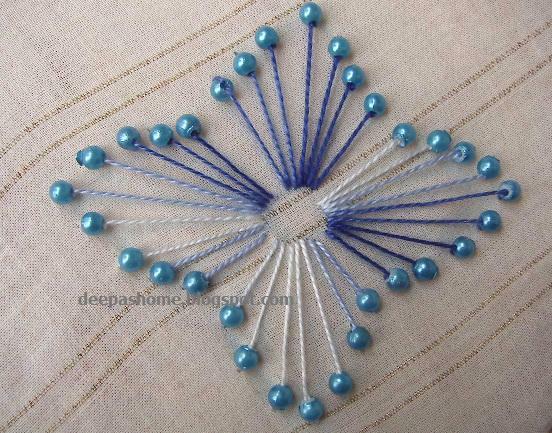 this one with beads is fascinating. Very lovely! I will need to try this! 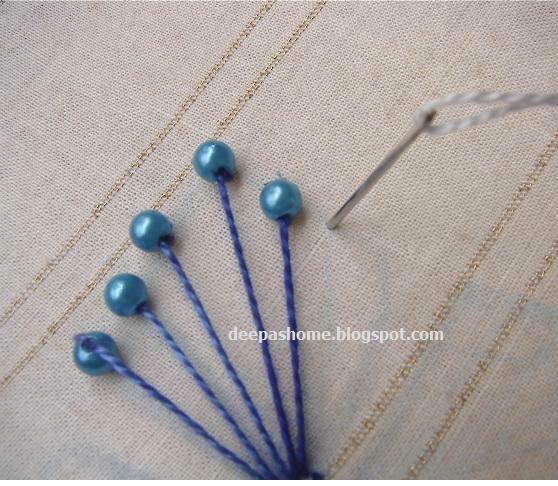 A Good Variation.I did this work with sequins in a top for Aparna.It was a brass colour bead.But this concept never struck me to put it in the tip.Can you try with a contrast thread for the Spikes[? 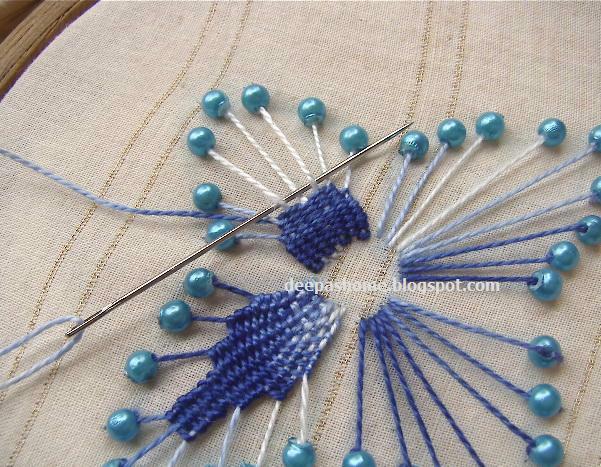 ]'n'Beads?Beading well explained.This is a wonderful Patience weaving. This is so beautiful! I found you through a comment you made on Mary Anne's blog. I may just need to use this on one of my bead journal pieces. If you take a check out my blog in the next couple of days, you'll be able to see my latest addition. I can't take my photos today as it's too windy and dull. I sent a comment, but don't think it went through. I'm so excited to try your tutorial. It was wonderful of you to take the time to make this. Mother would have been so pleased. This is just beautiful. Kamal kadai with beads is great idea.Would love to try it out.Many thanks for the tutorial and thanks for your encouraging comments on my blog. Looking forward to more beautiful tutorials from you. 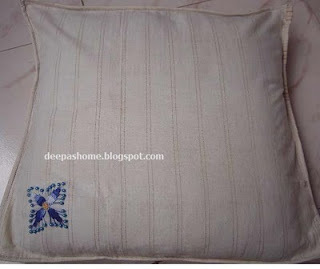 This is such a beautiful design, Deepa! Thanks for the tutorial. I must try this sometime. You've made something detailed look so easy! How pretty is this! I love the use of beads, the embroidery seems more precious. Lovely deepa, I will try this. Hi Deepa, I like the effect: it reminds me of cluny tatting, too. Nice and creative variation. This improvisation is superb. 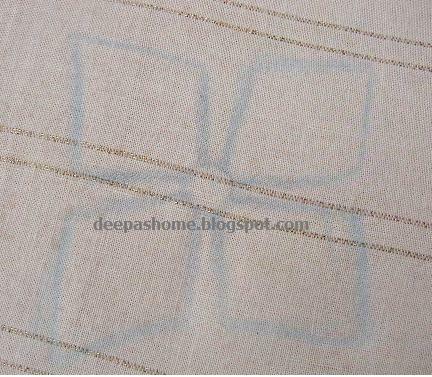 This is a wonderful design Deepa. I just love what the weaving creates and the beads are a lovely touch. hey deepa, lovely tutorial. you have certainly taken embroidery to the next level. I might give this a go. Don't know if you have finished you cushion by now, but what you could do to complete your cushion is either add some more of these motifs at the corner in a spray or maybe use different sized beads and heavier thread to make motifs of different sizes. 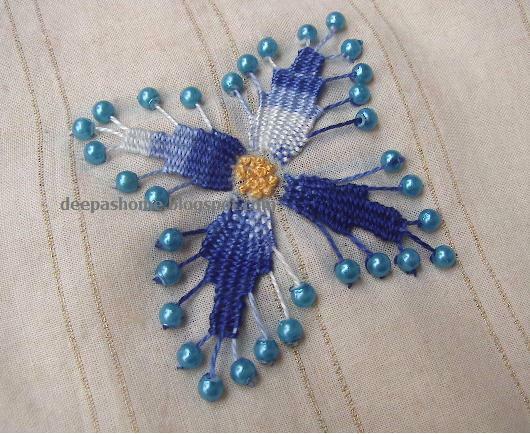 Beautiful work Deepa.I will try this.Your tutorial is always wonderful. Love this flower ... Is really a great detail and idea!! Congratulation!!! Thanks for your tutorial . Wonderful design. Beaded kadai kamal is a great idea. Gracias por compartir el tutorial de esta linda flor. Saludos desde México. What a lovely flower! I'd love to do it on a card as a lovely little present for someone.....Thankyou! i just found your blog and this post is amazing! I am so excited, can't wait to try this! Thanks so much I love it. i will be putting this in my handwork. Have only just come across your post and am so glad I did. This is just beautiful. I have been looking for something different to try and this is it. Thank you so much for sharing. Very beautiful, i definitely try this. 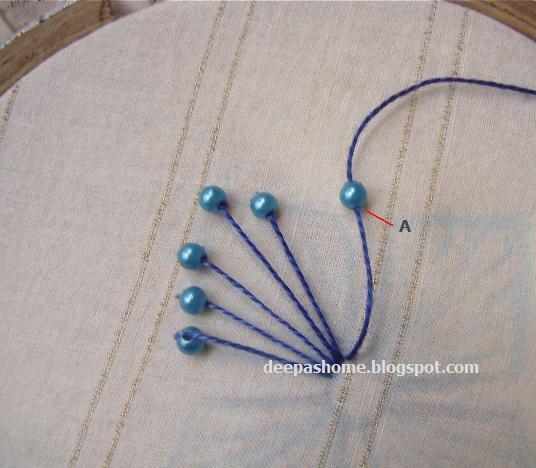 Deepa, this tutorial is widely copied on youtube.Some people don't have ideas of their own. Thank you for your concern anon.I can't stop copycats, so I have stopped posting tutorials.